Photograph from the Curzon Collection: 'Presented with feelings of friendship and sincere admiration to Lord Curzon of Kedleston, Viceroy and Governor-General of India, by H.H. Rasulkhanji, Navab Junagadha. 1900', of the sculpture on the wall of the Samprati Raja temple taken by the Solankee Studio, Rajkot, in c.1900. The Girnar mountain in Gujarat rises more than 900 metres above the plain and is particularly sacred to the Jains. It was an important pilgrimage centre since the 3rd century BC as indicated by the inscriptions on a boulder with the edicts of the emperor Ashoka and the proclamations of a Kshatrapa and a Gupta ruler. Along the principal path that leads to the central peak there are gateways, shrines and tanks and the principal group consist of 16 Jain sanctuaries dedicated to Neminatha. These temples date from the Solanki period and later. The Temple of Samprati Raja dates from 1453. The clustered tower over the sanctuary is a later renovation. The mandapa is roofed by a pyramid of miniature pot finials. 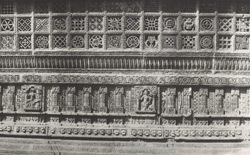 The sanctuary and mandapa have projecting porches with pierced stone screens carved with geometric and foliate motifs.